A large upper ridge dominates south-central Europe while two upper troughs are located to the north: one over N Atlantic and another one over Russia. In between, a fast moving short wave trough crosses the North sea and N Germany during the afternoon and evening hours. A surface cyclone with an associated frontal system moves across Germany towards Poland and Czech Republic. A MDT risk has been issued for E-CNTRL and NE Germany, W Czech Republic and WNW Poland with threats for large to very large hail, severe damaging winds, torrential rainfall and tornadoes. Within the strong westerly jet streak, a rather fast moving short-wave trough crosses the risk area and provides large scale ascent for rapid storm initiation in the mid afternoon. Once the cap is eroded, storms will begin to fire in central Germany and rapidly organize into supercells in the moderately sheared and extremely unstable environment. Various models are in good agreement regarding the amount of instability available, ranging from 3000-5000 J/kg of SBCAPE with up to 3500 J/kg of MLCAPE, despite some overdoing of the surface dewpoints. Combined with 40-50 kt of deep layer shear and 100-200 m^2/s^2 of SR helicity, organized severe storms are expected. Primary threats will be large to very large hail, where locally hailstones 5-8 cm in diameter are well possible given the amount of instability available in the hail region. Severe damaging winds and torrential rainfall are likely as well. Tornado threat will be enhanced in the northern parts of the MDT risk area closer to triple point and warm front where helicity will be maximized. Any better storms forming near this boundary could lead into tornado threat. Towards the evening, when forcing pushes further east, activity is expected to cluster into large MCS or two, possibly forming a QLCS moving into W Poland and W Check Republic with main threats for severe damaging winds, large hail and torrential rainfall. ENH/SLGT risk have been issued surrounding the MDT risk area where isolated severe storms with threat for large hail, severe winds and heavy rainfall are possible. Coverage of the storms will be much more limited than within the MDT risk area. 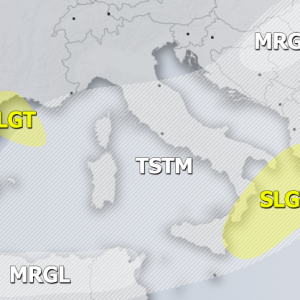 MRGL risk areas have been placed across parts of central Europe into SE France and the Alps, NW Russia, E Black Sea, E Algeria into N Tunisia and N Spain where only isolated threat for some organized severe storms exists. Some threat for large hail, severe winds and torrential rainfall exists.